A sailor with free time and the skill would carve some scrimshaw. No time for Scrimshaw work in my ship Dave. If you do enter the doldrums, you will need some oarsmen. Bit sad that story...I assume its ok when you have drunk the contents! Last edited by KDz; 03-23-2016 at 04:39. Last edited by KDz; 03-23-2016 at 12:05. Welcome to the Wardroom Midshipman! Perhaps we should try for some salvage. Here is one worth salvaging. One more for your collection. The San Miguel was a member of a Spanish treasure fleet, which was completely lost in a hurricane on 30th July 1715 whist sailing from Cuba to Spain. But it is only 1628 now Dave. The year is 1715, and all of Europe has been at war for 23 of the last 26 years. The last of the two wars The War of Spanish Succession began in 1701, and ended with the Peace of Utrecht in 1713. News traveled slowly in the eighteenth century and it was 1714 before the last of the hostilities finally ended. During the wars it was very dangerous for the Spanish treasure fleets to attempt to sail back to Spain. At war against more than a half-dozen European powers with France and Bavaria as its only allies, Spain faced quite literally a sea of hostile ships determined to capture the Spanish treasure fleets. Under these conditions, even the lowly cabin boy could become a very rich man with the capture of a Spanish treasure ship. Faced with these conditions, Spain kept the treasure fleets in the Americas until the end of the war. The 1715 fleet was the first fleet of treasure ships to sail for Spain since the end of the war. During more than 300 years of treasure fleet sailings from the Americas to Spain, the 1715 fleet was the single largest loss of treasure for the Spanish Crown and it happened at a time when Spain was desperate for treasure. 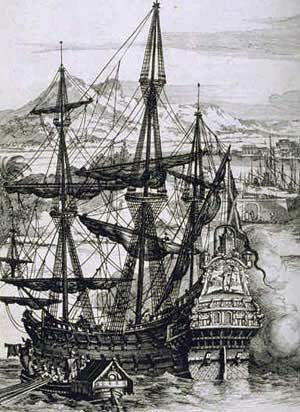 During the war the English captured or sank a great many of Spain’s treasure ships. The two Spanish Fleets, the Terra Firme and Nova Espana, joined in Havana to take on supplies before sailing homeward as a combined fleet. When the fleet left Havana there were eleven Spanish ships and one French ship, the Griffon, for a total of twelve. Some people believe there were actually twelve Spanish ships for a total of thirteen ships in the fleet. But, this is due more to a misunderstanding of the Spanish records than any actual evidence of a thirteenth ship. The Spanish fleets had been in the Americas for two years waiting to sail for Spain. During that time a very large treasure was accumulated, some estimates have the registered cargo valued at over 7,000,000 pieces of eight (well over $100 million USD in today’s value). No one knows how much unregistered treasure was aboard the ships and it could have easily been as much or more than the registered treasure. Once the ships were made ready for the homeward journey, they sailed from Havana harbor on July 24, 1715. The ships sailed past the Florida Keyes and up the Florida Straits. Once sighting Cape Canaveral the fleet would turn towards Bermuda. Once Bermuda was sighted the fleet would sail for the Azores, and then onto Spain. This was the route of the Spanish ships for more than 300 years. As the fleet sailed up the Florida straits the Spanish ships hugged the Florida coast, yet far enough out to sea to take advantage of the northward flowing Gulf Stream. Captain Antoine Dar of the Griffon was wearier of sailing close to the Florida East Coast; he kept the Griffon further out to sea and east of the Spanish ships. The weather was fine for the first five days. However, on the 29th of July the weather changed. The ocean became smooth with long low swells coming from the southeast, the air was heavy with moisture, and a gentle breeze caressed the north bound fleet. The experienced sailors within the fleet recognized this weather as the sign of an approaching hurricane. This would have been a good time for the Spanish ships to join the Griffon further off the Florida coast. But, the Spanish would wait until it was too late to make this move. As the fleet plowed onward towards Cape Canaveral the winds continued to pick up steadily. By the afternoon of July 30th Captain General Ubilla ordered his fleet to change course to head directly into the wind. It was already too late. The fleet was maintaining its distance from the dangerous coast with its reefs and rocks, right up until the hurricane caught up with them. At about 4 am on the morning of July 31, the hurricane struck the fleet with all its fury, driving the ships ashore. The Santisima Trinidad (also known as Urca de Lima) found a cove on the Florida coast. It was in this cove that the ship was driven up on a sandbar. Because of the protection of the cove the Santisima Trinidad was the only ship of the fleet that did not break apart when it wrecked. The food and other supplies on this ship helped to sustain the survivors of the disaster until rescue ships arrived. Captain Dar’s ship became separated from the Spanish ships during the storm. Unaware of the fate of his companions, Captain Dar sailed onto France. There are some who state that there is no evidence that the Griffon survived and returned to Europe. The Griffon collected treasure in South America to settle debts owed by Spain to France and to French merchants. So it had a great amount of treasure onboard. However, once the cargo was signed for it was no longer Spanish treasure and did not sail to Spain. The Griffon arrived safely in Le Havre. Those claiming the Griffon did not survive; base this on the records in the Archives of the Indies in Seville, Spain. The Spanish records list the Griffon as being part of the fleet, but do not record the Griffon’s return to Europe. This is because the Griffon did not return to Spain and had no cargo or treasure which was bound for or the property of the Spanish Crown or of Spanish interests. In other words, they paid their debt in South America when they loaded the Griffon, and whatever happened to the Griffon was a French problem not a Spanish problem. The Spanish had no interest in the Griffon. Others on the internet who also continue to claim the Griffon was lost and no evidence supports the ships survival are merely repeating the early research of those who looked in the Archives of the Indies, but did not look in France for evidence of the ships return. The Spanish immediately set about salvaging the shipwrecks, recovering over 5,000,000 pieces of eights worth of treasure by the end of the year. By the end of 1718, the Spanish authorities reported back to Spain that all of the registered treasure had been recovered. A note about this claim. Many of the items registered onboard the ships was not recovered, however, a treasure equal to the amount registered on the ship manifests was recovered. To avoid paying a 25% tax to the King, great quantities of treasure were smuggled back to Spain aboard the ships. Often the amount of unregistered illegal treasure was as much or more than the registered treasure. There are even recorded instances of ships being caught carrying more than twice as much illegal treasure as registered treasure. In one instance all the ships officers were condemned to ten years at hard labor aboard galley ships as punishment for their part in the smuggling which was discovered aboard their vessel. For 299 years people have been salvaging treasure from the wrecked 1715 fleet along Florida’s coast, with no end in sight. The missing ships of the 1715 fleet are: the Maria Galante, El Senor San Miguel, El Cievro(Also known as La Galleria) and the Nuestra Senora de la Concepcion. The El Senor San Miguel and El Cievro are believed to be sunk off of Amelia Island, Florida (Amelia Island is in Nassau County Florida which is situated on the Atlantic Ocean on the Georgia/Florida border). An urca is a cargo ship and Lima was the Captain of the Santisima Trinidad, so Urca De Lima translates into English as “the cargo ship of Lima.” Sometimes this wreck is listed as urca de Lima in the Spanish records (or cargo ship of Lima) and this is the cause for the misunderstanding as to the number of ships in the fleet. So, out of eleven Spanish ships in the 1715 fleet seven have been found, two are believed to have been found, and two are somewhere in the Atlantic Ocean (your guess is as good as anyone’s as to where). We know that the Wedge Wreck is the Urca De Lima or Santisima Trinidad wreck. The description of the wreck and the fact that it was the only shipwreck to survive the hurricane intact substantiates this. The other wrecks are identified based on the treasure which has been found near those locations, but there is no evidence confirming these identifications though they are probably correct. The modern era of salvage on the 1715 fleet began with Kip Wagner in the late 1950s. An associate of Mel Fisher’s, Kip Wagner was already working the 1715 fleet wrecks when Mel Fisher arrived in Florida in 1963. He had heard that people could find Spanish silver coins on the beach after a storm. Armed with a surplus army metal detector (used in the army for detecting mines) Kip hit the beaches. Not only did he find silver, but he began investigating the find to discover where the silver was coming from. After diligent research Kip discovered the source must be the lost 1715 fleet. He applied for a salvage permit from the State of Florida. Then he organized a company, the Real Eight Company, and sought financial backers to pursue the treasure. Now that's a treasure worth chasing me hearties. Think of all the beer that would buy! Last edited by Bligh; 03-26-2016 at 10:37. After all this talk of treasure, my tipple for today must be. Not forgetting the gold bullion. Last edited by Naharaht; 03-27-2016 at 16:34. Less valuable, but more useful? This should add even more sparkle to our hoard. How about a few doubloons? This treasure is mounting up. I just thumbed through this thread. That is one heavy night out! Yes, this has gone a little crazy, Hugh. We can throw in a few of these for good measure Morten. And your bonus ale for the day is. This is for my next game! That is a great shape for a bottle, Hugh! Snap! See my 538 Dave. How about a drop of 'the hard stuff'? No need to apologies That will do very well Dave. I have probably done the same. Danish customs & tax? Oh No! Arr! I detect a change of tack me hearties. No one expects the Excise men. Today's brew is a different Scuttlebutt. Every one needs a hair of the dog.